First published November 9 2012, updated and republished February 28 2013. Until further notice there are diversions around Rouen, heading both north and south, as the main bridge for vehicles over the Seine at Rouen has been closed due to an accident. 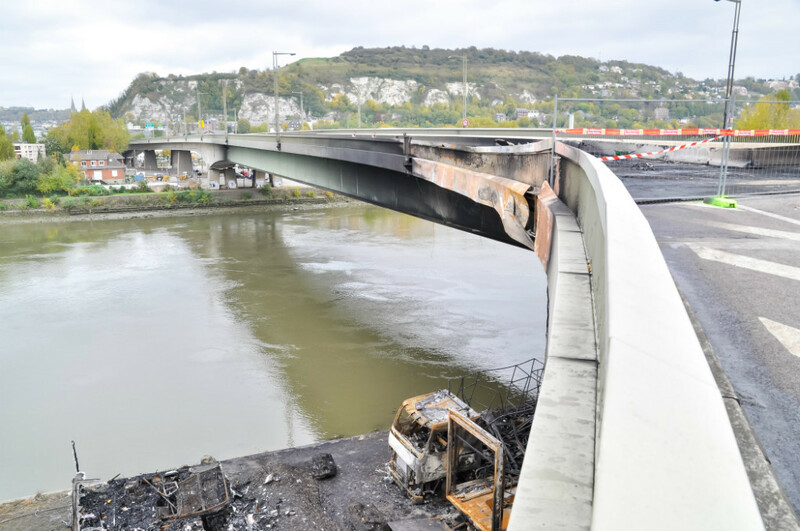 In October 2012 a petrol tanker crossed the central reservation, crashed and caught fire on the Pont Mathilde; several vehicles beneath the bridge were destroyed in the conflagration and while no-one was seriously injured, the damage to the bridge was severe. Since October an emergency circulation plan banning HGVs from certain routes through the city has been implemented and the bridge is closed to all traffic. Diversion signs are in place and the bridge will remain closed while repairs are carried out during 2013. The diversion routes suggested for cars are shown below. 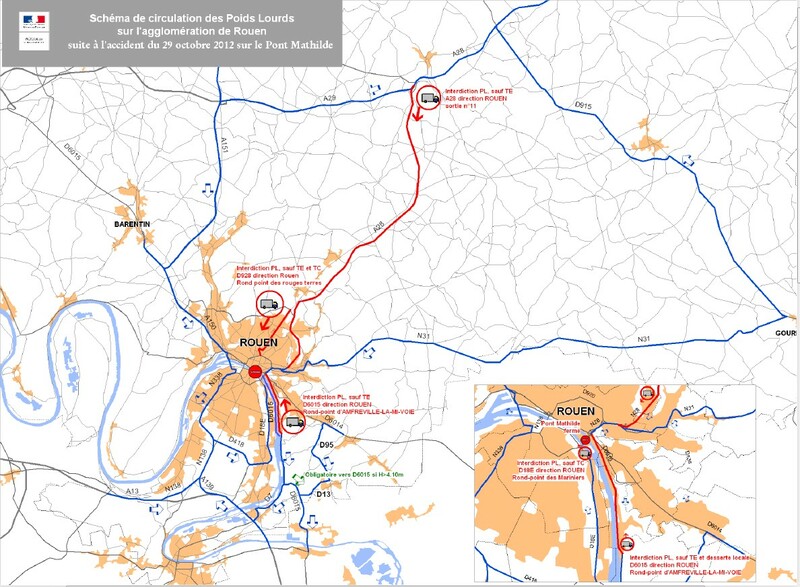 We have tried the Rouen north-south diversion in both directions while travelling to and from La Basse Cour and it poses few problems (in fact we found it more pleasant with fewer traffic lights and junctions) though it does take a few minutes longer. We tried it northbound around lunchtime and southbound shortly after lunchtime, on a weekday each time. We may actually make this our regular route for the annual return to visit family in the UK as it is less stop-start than the normal route and misses the horrible industrial estate rat-run with all its roundabouts and traffic lights. Coming on the A28 from the north to Rouen, the diversion route takes the A29 in the direction of Amiens and Le Havre, then the A151 in the direction of Rouen, then the A150. If you are heading south to Le Mans/Bordeaux etc. you then pick up the A13 west to Le Havre and shortly turn south on the A28, or earlier onto the N438 if you want to avoid the A28 tolls. We think the tolls are well worth it as the A28 is speedy and hassle free, unlike the N438. Whichever you choose, just be alert to be in the correct lane and follow the diversion signs! Heading north is the same route around Rouen in reverse, also with diversion signs. Coming on the A13 from Paris to Caen, the suggested route is A139, RN138 /338 and then into Rouen on the A150, A151 and A29. On the left bank quays of Rouen from East to West, traffic is allowed from the quay Cavelier de la Salle to Boulevard Béthencourt.